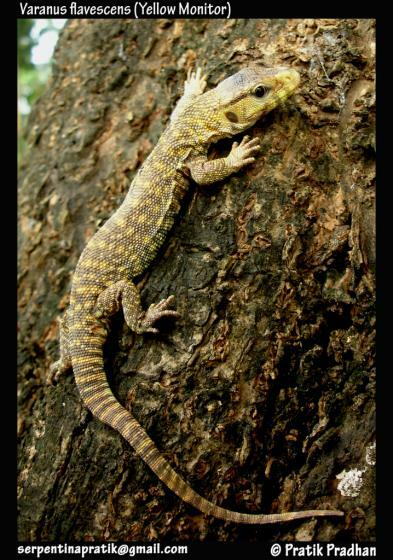 Can you confirm these amateur observations of Varanus flavescens? Distribution Flood plains of Indus, Ganges, and Brahmaputra rivers of Pakistan, India (Assam, Himachal Pradesh, Bihar, Punjab, Uttar Pradesh, West Bengal, Orissa), Nepal, Bhutan, Bangladesh. Comment Distribution: Has been reported from Thailand (Trang) by BOULENGER (cited in TAYLOR 1963), but is not listed for this country by later authors such as CHAN-ARD et al. 1999. 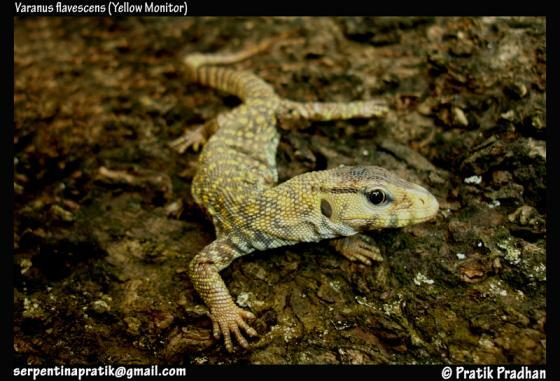 Types: Hardwicke and Gray’s (1827) description of Monitor flavescens was based on a drawing. According to De Lisle (2009), the “iconotype” of V. flavescens was depicted on plates 60 and 61 in Hardwicke’s (1829) “Illustrations of Indian Zoology.” This work, however, was published by Gray as a series between 1830 and 1835 (Wheeler 1998). For M. flavescens, Mertens (1942) referred to plate 67 in the second part (1834) of this work, which probably represents the “iconotype” of this taxon [Koch et al. 2013]. Brygoo, E. R. 1987. Les types de Varanides (Reptiles, Sauriens) du Museum national d'Histoire naturelle. Catalogue critique. Bulletin du Museum national d'Histoire naturelle, Paris, 4e ser., 9, sect. A (Zool., BioI. & Ecol. anim. ), (2), supplement, 21-38.